It seems that stories about prostitutes come in two categories: the Low End prostitute stories (or Ho Dramas) where prostitution is portrayed as dirty, vile and lower class, and the High End stories (or Courtesan Dramas), where prostitution is portrayed as a glamorous, melancholy profession. Low End stories usually take place in slums, the main protago-tute is usually sickly, and there are no men except the drunken, syphilitic kind. These are the sort of Victorian stories meant to warn girls against straying too far from home. High End stories, on the other hand, are about the swankiest courtesans living lives of glitz in their gilded cages. But can enormous earrings buy you happiness? No! They just make you look pretty when you cry. And I look pretty when I cry. Umrao Jaan is a High End tale about the hilarious hijinx of harlots living in a harem in Hyderabad. OK, that's a lie, there is no hilarity and they're in Lucknow, not Hyderabad, but I wanted to keep the alliteration going. Anyway, welcome to 19th century Lucknow! And welcome, welcome to Sufi Islam, oh glorious glorious Sufism. I should probably mention that I love the culture of Sufism; if shisha, ghazals and carpets are involved, then I am a happy camper. Unfortunately Urdu ghazals take a beating in translation, so much of the magic is lost, but if you want a taste of what it could be like, here's a very well-translated one by Mirza Ghalib. 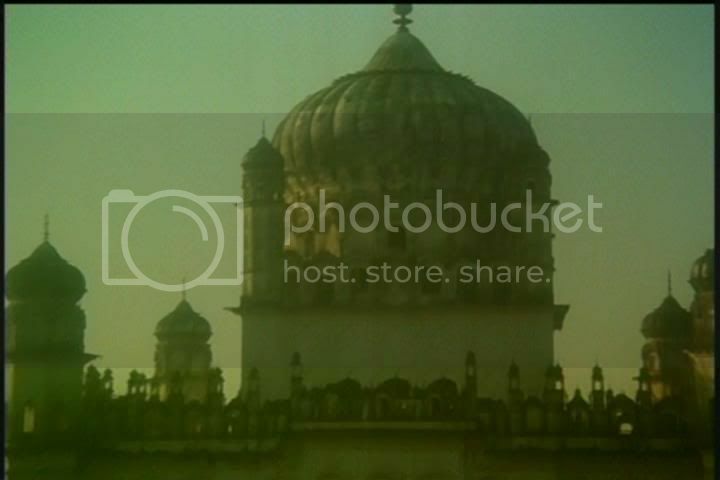 Come admire the beautiful Islamic architecture in Lucknow... today! What about the film, you ask? OK, OK. The plot is this: Umrao Jaan (Rekha) is the most famous courtesan of Lucknow. She composes couplets with the best of 'em, and men come from all around to sit at her feet and laud her talents. "Allah be praised!" they cry. Umrao's life is a colorful spectacle of decadance and art. She is tutored in music, dance, and poetry, and everyone is forced to agree that Umrao is maybe the most awesome harlot in the harem. Gauhar Mirza (Naseeruddin Shah) agrees very much so, and harbors a not-so-secret crush on Umrao. Yet Umrao is sad. First, she never wanted to be a harlot in the first place but was kidnapped into the job. Second, she loves the pudgy-yet-kind Nawab Sultan, who was recently married off to Some Lady. Third, her next lover turns out to be a bandit on the run from the fuzz who is promptly killed during their elopement. Fourth, the British arrive and just ruin everything. Oh, dammit. Boyfriend #1, Nawab Sultan. Likes: poetry, pieces of gold, and ruling over small territorial empires. Dislikes: disobeying his mom. Boyfriend #2, Faiz Ali. Likes: not dying. Dislikes: dying. Boyfriend #3, Gauhar Mirza. Likes: eating, womanizing, apologizing. Dislikes: getting shafted. The movie itself is a bit like Thomas the Tank Engine going uphill: a slow start and some rusty gears, but once you hit the halfway point, you enjoy it more and more. It seems like they spent all of their budget on the set design, and then decided to make their cameras out of cardboard and glue. But, as the movie progresses, you forget about the jerky and amateurish cuts and just enjoy the vibe, man, the vibe. I feel no shame in admitting that I cried like a baby when Umrao reunites with her family. Rekha is lovely in her role. People criticized her dancing but, well, dance-philistine that I am, I saw no problem with it and thought it was nice, in fact! She also juxtaposed amazingly well the restrained training of a courtesan, all tight smiles and manufactured flirtatiousness, with moments of real, fiery emotion (for example, when #2 dies or when #3 pulls the carpet out from under her... not literally). Naseeruddin only pops in now and again to establish his character's key traits - rascally roguishness and a bit o' soul - but he's not in it enough to really get a full-blown Shah-xperience. Fun fact: Shabana Azmi's mother, Shaukat Kaifi, plays the mother superior pimp lady, Khanum Jaan. And, in the 2006 remake, Azmi plays her as well! You see? It's all a circle! This song made me cry too. Stream the soundtrack, my lovelies. Umrao's brothel in Lucknow was shot at a real time brothel of a Lucknowi king. Filmapia told me that.